This week's challenge at SHOPPING OUR STASH is "5 a Day" we want you to use fruits or veggies somewhere on your project. My friend Brandy would be so proud of me for this one...I broke into the Cherry-O papers that I got from her....ohhhhhhh let's see...I think it was 2010?? I love them so much that I have resisted using them...until now. As of last summer, we now live in the Niagara Region, aka the "Fruit Belt." The area is famous for cherries and peaches. You can get amazingly fresh cherries at the farmers markets and farm stalls around town right now and they are soooooooo good! And it makes good sense to me to buy from local farmers when you can. Hubster's birthday is coming up this week, this past weekend his parents had a family BBQ for his birthday. I made these fun BOX IN A BAG as a little gift for his mom and aunt...what am I going to put in them?? Cherries of course!! 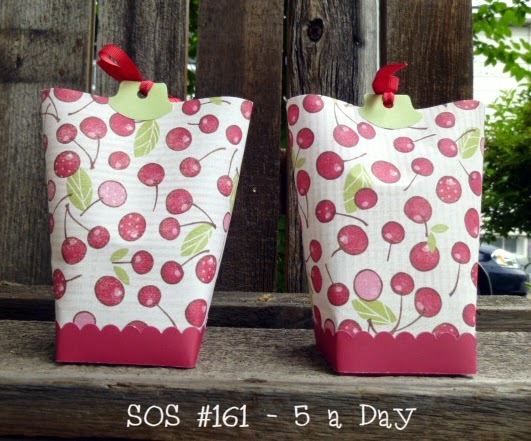 Visit the SOS BLOG for all the details on the challenge and remember to visit my teammies and show them some crafty love!! Awesome box in a bag, love that paper, you rocked this challenge. So much for that... I thought you were going to use BRANDY for your 5-a-day topic. I mean brandy is a fruit, right? Especially if you inject it into cherries first. Anyway, love that cherry paper and your box in a bag creation. I just might have to join in this swap! Holy moly! These l'il bags are sooooo cute, Donna! That paper is absolutely perfect! Is that bunny new? He's so cute! And so are your bag-boxes, or box-bags... definitely worth cutting into that paper! Oh, I remember those bags! Aren't they fun? Your paper choice is perfect, and well, yeah, no hoarding allowed here, missy! Now I want cherries, preferably sour ones. lol, I love the bunny! Thanks for Feeling Fruity with us at The Crafting Cafe this month! I haven't made one of these for a long time, but they still look as cute as they ever did, especially with the cherry paper! Cute stuff!! Great projects and nice to see something other than a card. Thanks for joining us at the Crafting Cafe!